I have mentioned many times how sad I get when major injuries happen in the NBA. As a person that used to play competitive basketball, I know how heart-breaking they can be and how tough the physical and mental recovery can get. Unfortunately, Jusuf Nurkic suffered a brutal one yesterday, fracturing his left tibia and fibula (these are essentially the two long bones in the leg). It’s a huge blow to Portland’s playoff aspirations, but the most important thing is for Nurkic to return healthy next season. Get well soon big man! !Danuel House was the most consistent contributor from last week’s suggestions with 3 triples per game, while Jakob Poeltl and Fred VanVleet were both steady, if unspectacular. Dorian Finney-Smith’s 4-game week is over and so is his streamer appeal. Finally, Hassan Whiteside was the main Sell candidate and with 19, 24, 5, and 14 minutes played last week, you can guess that nothing has changed dramatically. Fantasy Basketball: LMA with the O! Earlier in the season, I was ROFL and LMAO, as LaMarcus Aldridge was struggling with consistency. He’d pop a 37-point game then produce back-to-back 15-pointers. In the month of December, he scored 6 points twice and blessed us with a 7-point outburst. But then, things started to click. The consistency returned and now he is the lede for this world famous blog. Ok, maybe not famous but we are international, so world is appropriate. Shout out to all the homies in other countries. Over the past seven games, LMA has been a top 20 player. On the season, he’s top 25. Who’s laughing now? Surely not I. Sorry Shirley. Wasn’t talking to you. Anyways, DeMar DeRozan missed yesterday’s game, but regardless, LMA has had a usage rate over 30 over the past seven games and attempting 17.4 shots per game. The efficiency is excellent (53% from the field and 85% from the line). 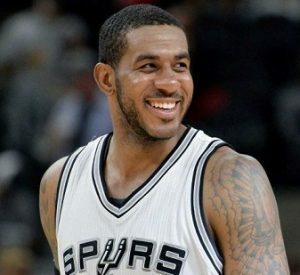 While he won’t provide many threeecolas, LMA averages 23.1 points, 9 boards, 3.6 dimes, 0.6 steals, and 1.9 blocks. LMA with the O! I loved Biggie. Being born and raised on the West Coast, that may be viewed as blasphemy, but whatever. Even though I went to school in NY and worked in the City for many of years, the simple fact of the matter was that he was a smooth, lyrical genius. He was Unbelievable. 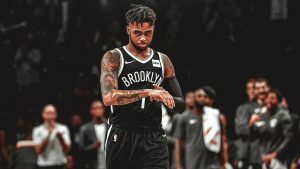 “Live from Bedford-Stuyvesant, the livest one…Representing BK to the fullest.” Indeed he did, which is exactly what Spencer Dinwiddie did last night. All in 30 minutes off the bench. He was Unbelievable. The 39 points were a career-high and, over the past four games, he’s been a top 40 player with an insane usage rate of 34.1!!! 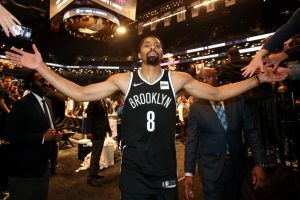 Now, he’s not going to start and will likely average a tick under 30 minutes per game, but Dinwiddie is a professional getter of buckets and will chip in 2 threeecolas, 5 rebounds, and 0.5 steals per game, which will place him in the top 110 range. But, as last night showed, he will Hypnotize from time to time. Over the past six games, Barnes has been a top 60 player, but he’s more like a top 100 player. Since 2014, he’s finished as the 109th, 119th, 79th, and 90th player. Barnes doesn’t provide much of a ceiling but the floor is pretty high, as he shoots a ton of shots. Not everyone likes bookstores, but they do provide a function for some. That’s the best way to describe Harrison Barnes for fantasy. I recently met a conspiracy theorist. He seemed so proud and satisfied that he had the inside scoop on so many topics (“You know what’s going on in Cuba, don’t you?”), while the rest of us only know what the government wants us to know. Well, I went down a rabbit hole to which he directed me just for kicks. Wow, there are a lot of crazies out there trying to obtain knowledge that no one else has, regardless of how insane it is. Shout out to Kyrie. I realized, though, that I can relate. At least when it comes to fantasy basketball. There’s certainly a draw to uncovering a conspiracy and being part of only a small group of people that feels wiser than everyone else. Or, more relatably, being the only person to know a secret. This is how I felt the first time I manipulated a fantasy bball player rater. I was finally confident enough in my Excel skills to subtract categorical columns for punt rankings. I had decided to go all-in on a punt free throw percentage 8-category Roto dynasty team. Removing the FT% category dramatically changes the value of many players. I realized that I could trade players for much more than they were worth to me while acquiring players for much less than they were worth to me. Obviously, the downside was taking last place in a category. But since I was near the bottom in FT% anyway, I only lost maybe 2 points there while gaining something like 7 or 8 total points combined in other categories. The problem in a league like that is that I would’ve needed to get first in nearly every other category to win it all. I peaked at second place. Yeah, yeah, you’re aware of the simplest of punt strategies. I know. But, aside from overrating rookies in dynasty drafts, this is really what I’m most passionate about: the concept of ignoring categories that aren’t going to help or hurt you.